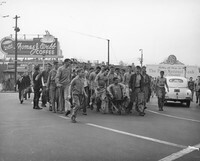 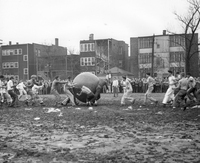 Students take a victory lap after a 1946 pushball contest. 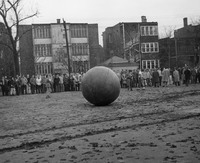 Push ball in place before the start of a match between freshmen and sophomores in 1946. 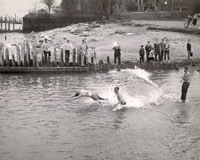 Members of the Freshmen class plunge into Lake Michigan after being defeated by the Sophomores during the 1946 Pushball Contest.